Rovos Rail is a luxury train that operates a choice of journeys in South Africa and to a number of African countries, with its main station in Pretoria. The decor evokes the elegance and refinement of a past era and the train benefits from modern comforts such as air conditioning. Service is both discreet and efficient. There are 3 types of suites, Pullman, Deluxe and Royal. Pullman Suites have a sofa seat that fold out to make 2 twins or 1 double bed, and an en-suite shower room. 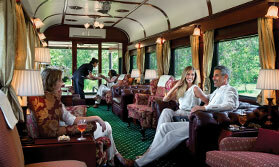 Both Deluxe and Royal Suites have lounge areas, with the latter the most spacious, each occupying half a carriage. All feature polished wood panelling, air conditioning, safe, fridge, internal phone system, power points and adaptors, hair dryer, and a dressing gown and slippers for each passenger. Each train has a lounge car plus a separate smoking lounge car, observation car and dining car, all with the finest fittings and furnishings. Meals are of the highest standards, made with fresh local produce. Lunch and dinner are complimented by a selection of fine wines. Operates: Rovos Rail operates train travel all year. Services between Pretoria and Cape Town (and vice versa), the most popular routes, have several departures each month. Locations and Routes: Rovos Rail’s hub station is Pretoria, with regular services to Cape Town (3 days/2 nights), Victoria Falls (Zimbabwe) (4 days/3 nights) and Durban (3 days/2 nights), all of which operate in the reverse direction. In addition there are services from Pretoria to Swakopmund in Namibia (8 nights/9 days), from Cape Town to Dar es Salaam (15 days/14 nights), and special golfing departures. All journeys include excursions and the longer itineraries include some hotel stopovers. Rooms: There are 3 types of suites, all air conditioned. Pullman Suites (7 sq metres) have a daytime sofa seat that converts to 2 single beds (upper and lower berth) or 1 double bed. They have a bathroom with a shower, luggage shelf, cupboards, a safe and minibar. Deluxe Suites (10 sq metres) can be configured as double or twin-bedded rooms, have a table and chairs, bathroom with shower, luggage shelf, cupboards, safe and minibar. Royal Suites (16 sq metres) can be double or twins, have a lounge area, bathroom with bath and shower, luggage shelf, cupboards, safe and minibar. There is 24 hour room service. Activities: Each journey includes at least 1 excursion, with the longer trips having several, including some overnight stops. Excursions cannot be guaranteed and may be affected if the train is delayed. Facilities: Each train has a lounge car, dining car and observation car, all non-smoking, plus a club lounge car where smoking is permitted. All public areas are air conditioned. The train has a selection of books, magazines, board games and playing cards in the lounges and observation car. There is a small gift shop on board. The train offers a limited laundry service, with a usual turnaround time of 28 hours. Bulk laundry is not catered for. Dress: Daytime dress is smart-casual. In the evening it is more formal, with men wearing a jacket and tie, and cocktail or evening dresses or suite for women. For excursions you will need comfy walking shoes, a sunhat and sun cream, and layered clothing for game drives. Blankets and waterproof capes are provided if needed. Dining: Meals are served in one sitting in the dining car, at individual tables. Meal times are generally breakfast is from 07:00-10:00, lunch at 13:00 and dinner at 19:30. Tea is served at 16:30 in the lounge or observation car. All meals, soft and alcoholic drinks are included. Children: Children are welcome, though they are requested to be respectful and quiet, as befits the adult atmosphere of the train. Longer journeys are not suitable to those under 13 years. There are no children’s activities or child-minding facilities on board. Health: The train travels though malarial areas including Kruger National Park, Swaziland, northern Botswana, Zimbabwe, Zambia and Tanzania. A Yellow Fever certificate is essential if travelling to/from Zambia and Tanzania. Communication: There is limited mobile reception on board, usually poor while the train is in motion. Passengers are requested to keep use of mobile phones and laptops to their own suites, so as not to disturb other passengers. There is no internet access on board. There are internet facilities at the Rovos Rail lounge in Cape Town. Notes: In South Africa payments are accepted in Rands only or major credit cards. In other countries cash payments are accepted in US Dollars only, bills printed after 2001. Most hotels accept credit cards. The layout and dimensions of the train means that it is not suitable for wheelchairs.